Have the Smart Betas become crowded trades? How can we tell? With the outlook for US growth uncertain, new smart beta investors in Minimum Volatility and Quality are paying a big premium today for the strategies. This premium is so high that their entire expected long-term return advantage is reversed into a return disadvantage over the next five years. Investors in Momentum are overpaying by enough to net them an expected return of essentially zero versus a cap-weighted index (before fees). New investors in Equal- Weighted and High Dividend Yield are overpaying somewhat, but some of their long-term return expected advantage is expected to remain. The best news continues to be for new investors in Value, who are getting a deep discount that offers them the opportunity to nearly triple their expected return advantage (2.7% vs 1% annually). What did we look at? We evaluated six “smart beta” alternatives to a US Large/Mid Cap Cap-weighted index exposure. These were 1) Equal Weighted, 2) Minimum Volatility, 3) Quality, 4) Value, 5) Momentum and 6) High Dividend Yield as defined by MSCI. How much excess return should we expect from these “smart betas” over the long-term? 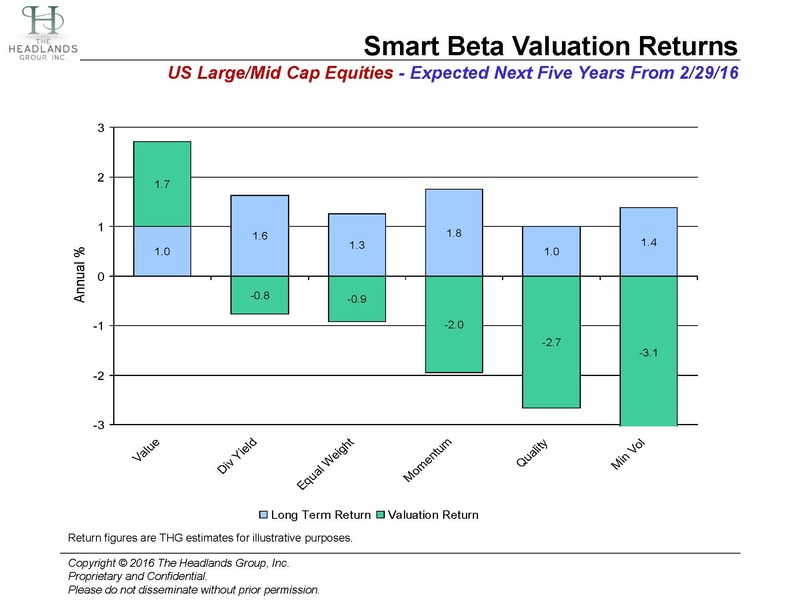 Are overvalued “smart betas” creating negative valuation returns that detract from their long-term returns? Investor enthusiasm can take market prices above value. The resulting overvaluation will create a negative source of return for the new investor, as it corrects over time. We refer to this as a negative valuation return. A negative valuation return will detract from an investor’s long-term return, which is compensation for bearing risk over time. Negative valuation returns are observable at the market level, the industry level and certainly at the individual security level. We can therefore also expect them at the “smart beta” level. At The Headlands Group, we are committed to making high probability of success investors. We transform client concerns about financial markets into the confidence that comes from knowing their investing experience will be a successful one. If we can succeed in getting clients to avoid “easy and popular” and allowing us to do “difficult and unpopular” on their behalf, we have made them into the “house” at the market casino and improved the odds that they will be successful over their investing lifetimes. We believe our clients perform better than most large institutions – despite not having the same investment resources.